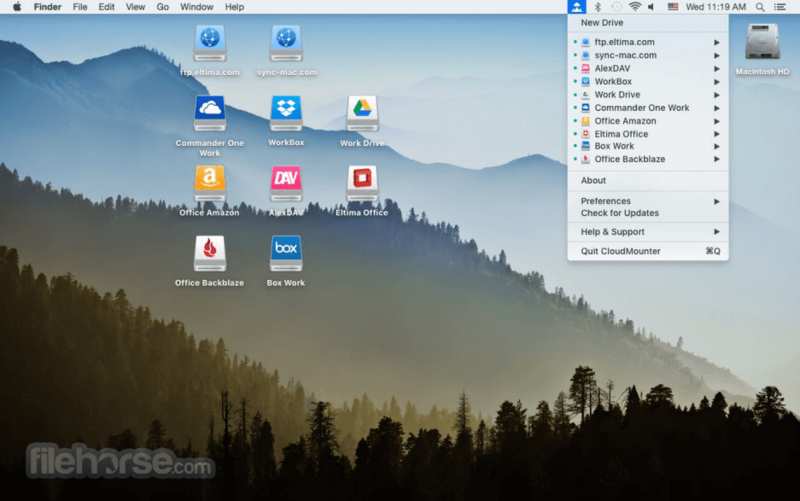 CloudMounter for Mac is a reliable system utility that allows mounting different cloud storages and web servers to your Mac as local disks. Mount Microsoft OneDrive, Google Drive, Amazon S3, Dropbox, FTP and WebDAV and access them as folders in Finder, as if they are located on your machine. Mounting cloud storage as local drive on Mac with CloudMounter was never easier! Mount cloud storage as local drive and work with online files the same way as with local ones. CloudMounter makes your cloud accounts easy to reach. Mount multiple Dropbox, Google Drive and Microsoft OneDrive accounts without having to transfer files to your computer. You can mount Dropbox accounts as drives without installing them on your computer and copying the content to your local drive. CloudMounter allows you to upload files to Dropbox just as if you were moving them to a local folder in Finder. Store any number of files of any size in your Amazon S3 or on WebDAV servers and get easy access to them with CloudMounter. CloudMounter brings your work with Amazon S3 storage to the next level. It is easy to mount your favorite secure online storage to Mac as a removable disk. This gives you the possibility to conveniently manage your data in your Amazon S3 account, choosing whether to connect to Amazon's entire account or mount S3 selected buckets. CloudMounter supports all AWS regions, including EU (Frankfurt) and Asia Pacific (Seoul). Mount FTP and SFTP server as drive and manage your online files as if they were stored on your machine — all using CloudMounter. The app safely stores all your server settings and passwords are kept safe in Keychain. Connect to your web servers through standard or secure FTP protocols, map FTP as local drive in Finder and access your online files as local ones — view, delete, create, as well as upload to and download files from your remote server. With CloudMounter you can conveniently view the full file structure of a website or a file server. CloudMounter keeps all files in your Clouds thoroughly protected. Encrypt Google Drive, Dropbox, OneDrive, Amazon S3 as well as the files on FTP/WebDAV servers.